I'll show you my card and then a copy of the Bingo Board. I colored the Bugaboo Stamps image with my ProMarkers, adding a bit of silver or gold metallic inks to the bells and the snowflakes. I decided to leave the little elves uncolored just for some contrast. I used an Unbranded die to cut the image, then matted it with forest green CS. That went onto a layer of bleached and textured red CS with a strip of plaid paper between them. I added metallic green and red ribbon along with a red ribbon bow, one of those I sew up by the dozens and toss in my stash for future use. 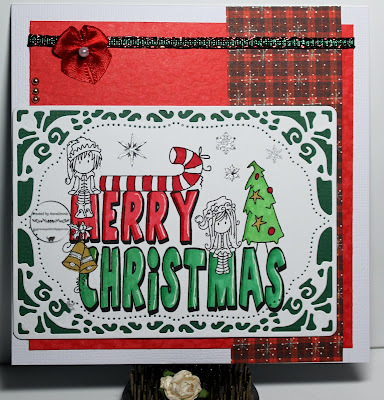 Such as beautiful Christmas Card. Nice work. Your card is adorable. A beautiful die. Thanks for joining us at the Holiday Chaos 2017 BINGO Challenge, Lisa Lynn GDT. Gorgeous card and loving the beautiful frame die. Very pretty Christmas card! I love that die cut frame! A fabulous card. Thank you for sharing with us at Christmas Cards All Year Round. A super card Connie and a lovely framed image.